Consisting of St. Vincent and a chain of islands named the Grenadines, this Caribbean vacation hotspot is filled with gorgeous tropical scenes, pristine beaches and a flourishing island culture. May is a great time to visit as the Maroon festival is held. This traditional celebration is where islanders drum, dance and drink in an effort to coax the gods to be generous with the rainfall. Have your cameras ready for the Dark View Falls, a pair of waterfalls that is an absolute must see! Explore the botanical gardens and colonial architecture in Kingstown. If you are looking to relax on the beach, there are many to choose from that also offer the usual water sports like surfing, scuba diving and snorkelling. 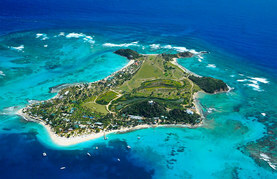 Visit St. Vincent and the Grenadines anytime, as its climate shows very little variation throughout the year.